These lamb kofta are meatballs in all but name but are loaded with dried mint, chili and pine nuts. Served with squash roasted in pomegranate molasses and zaatar and rounded out with Israeli couscous. 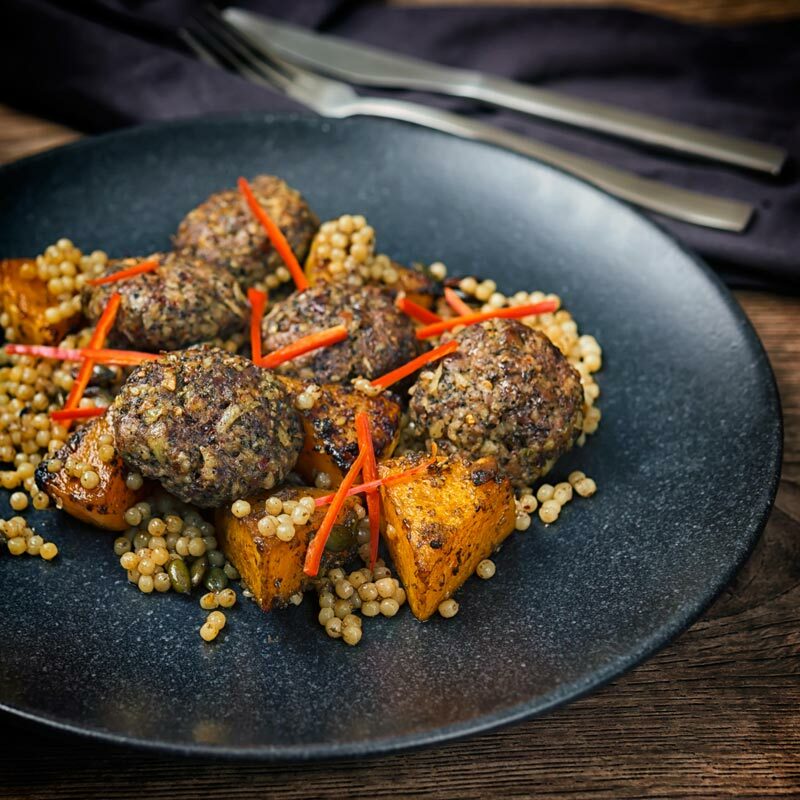 Lamb Kofta With Roasted Squash and Israeli Couscous. 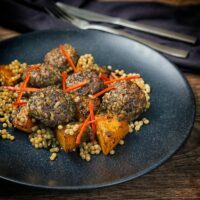 As far as I am concerned this lamb kofta recipe is one of my favourite new recipes I have developed recently. The flavours in this recipe, as far as I am concerned, are outstanding! They are very much firmly rooted in North Africa and Persia, they are suitably complex but not at all confusing. There is a sort of sweet and sour vibe going on with a pleasing amount of chili, although this recipe is not designed to be crazy spicy. 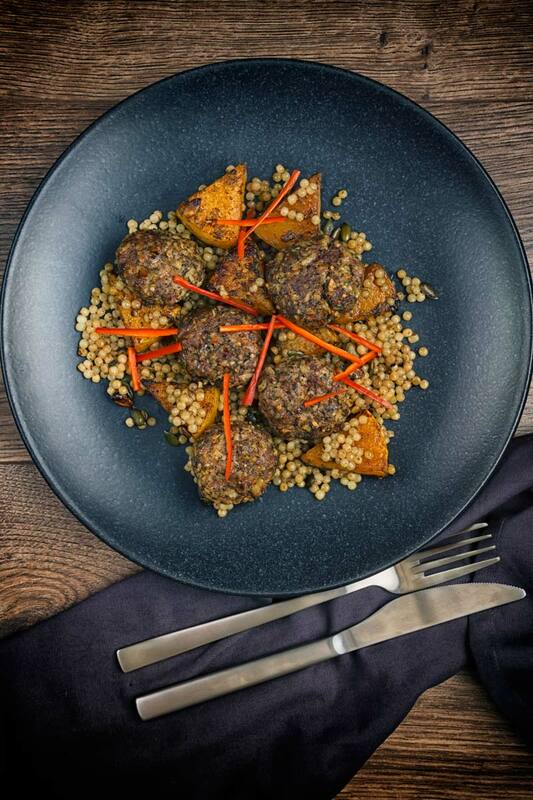 Sumac and Zaatar both feature and the couscous picks up all of the caramalised flavours from the roasted squash. It is a recipe perfect for a cold winter night and is a new way of thinking about meatballs. They are meatballs… Seriously, it is just a name used throughout the Middle East, Balkans and Central Asia to denote a meatball or even meatloaf. They are also referred to as kofte and just like meatballs they are endlessly flexible. This lamb kofta recipe is very much Middle Eastern in influence, but I have a fantastic chicken kofta masala recipe which is very much Indian in influence. Sometimes they are served as balls, other times they are formed onto skewers. As you can see the simple answer is that they are flavoured ground meat formed into a ‘patty’. 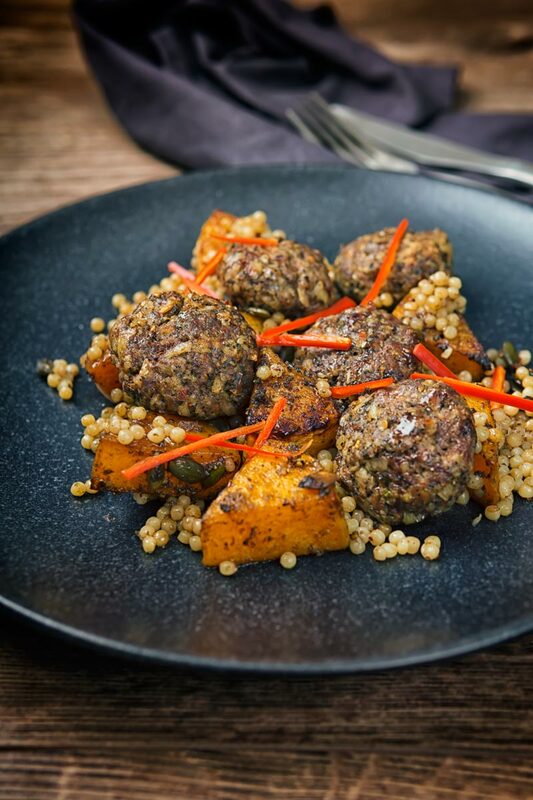 These lamb kofta are roasted in the oven alongside some butternut squash. Roasted pumpkin or squash is no real stranger here on my website. I use it all the time although most of the time it gets blended in dishes like my pumpkin risotto or in my roasted butternut squash soup. But it sits here as a roasted vegetable, it takes far less time to roast than root vegetables. It also takes to big flavours really well. For this recipe it gets roasted in pomegranate molasses and zaatar with a few pumpkin seeds to boot. In many ways the flavours are similar to those in the zaatar coating to this roast chicken leg recipe. Couscous is often served as a separate entitiy in recipes. Here though it is used to mop up all of the flavours from the baking tray and get them on the plate. I use Israeli couscous or giant couscous but you could use regular couscous if you wished. I also cook the couscous in just water, there is no need for additional flavour. There is more than enough flavour to go round in the roasting tin. Adding just a little of the cooking liquid from the couscous top the pan frees up any caught bits on the pan. These are also the best bits! All that is left to do the is sprinkle a little more zaatar and sumac and ponder why you did not make more! No need to go anywhere else, this lamb kofta recipe is a complete meal... 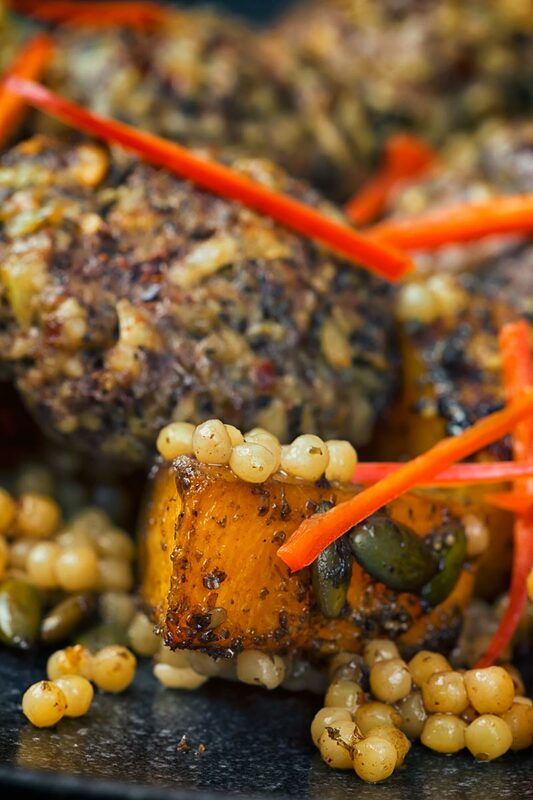 It features butternut squash roasted with pomegranate molasses and Israeli couscous and a sprinkle of chili! Place the shallot, garlic, pine nuts, chili flakes, and dried mint into a blender and blitz to a paste. If it needs letting down add a little olive oil. Add this paste to the lamb and then season generously with salt and pepper. Frying off a small patty will help you with seasoning. Form this mix into 10 meatballs (wet hands help) and then squash to form patties to around 1.5cm thick. Cut your butternut squash into around 20g pieces, I prefer to use the 'neck' of the squash. I cut two 1.5cm thick slices and then peel and cut into 8 wedges. Place the squash on a baking tray and add the olive oil and pomegranate molasses. Season with salt and pepper and the zaatar and then toss to coat well. Place in a fan assisted oven at 200°C or 400°F and cook for 10 minutes. After 10 minutes throw in the pumpkin seeds and drop in the kofta and bake for a further 15-20 minutes or until the squash is cooked. Then cook the couscous as per the packet, this usually takes between 12 and 15 minutes so time it to finish when the kofta are cooked. Finally, drain the couscous, remove the kofta and add the couscous to the pan with the squash and toss it around. Add a little of the cooking water to ensure that you have scraped all the liquid from the base of the pan. Plate up and sprinkle with the sumac and add chili ribbons if you dare! 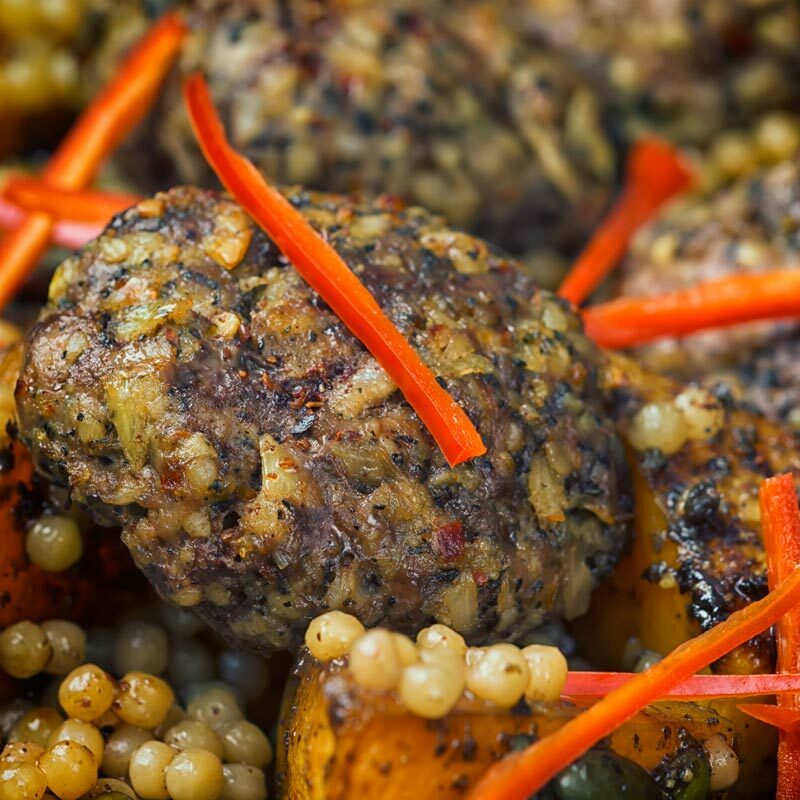 These kofta are just bursting with flavor! I love the combinations of the mint and za’atar AND sumac! And then serving with the earthy squash and the couscous! I wish I had some right now!! This recipe sounds right up my street! I love the spices you’ve used in the koftas and on the butternut squash too! Za’atar is one of my favorite spices even if it’s just on something simple like roasted potatoes. However, you made such a delicious meal and a gourmet presentation here, za’atar actually takes a backseat to all the amazing flavors that must have been present in this meal. Thank you, I like using zaatar as a seasoning in the same way as salt and pepper is used. It is not the dominant flavour but offers background notes and points of interest.